From the beginning, the Edgemoor Team made a commitment to make this a transformational project – to not just simply build a terminal, but to create meaningful opportunities for both minority- and women-owned businesses, as well as local residents to contribute to the project. The Community Workforce Agreement (CWA) for the KCI New Terminal Project is a critical step in delivering on that promise. What Makes this Agreement Significant? It is a single-project agreement. As such, non-union companies can decide to join their respective trade union for this project only. Non-union companies that decide to sign the CWA can bring 100% of their existing workforce to the project, and their entire Project workforce will have access to established union training programs while working on the Project. Up to $55-60 million in potential construction contracts are available for certified small minority- and women-owned non-union businesses that do not elect to sign the single-project agreement. Over the next eight weeks, the Edgemoor Team will work closely with union and community leaders to establish a framework for the Project’s Pre-Apprenticeship Program. Additional information on the Pre-Apprenticeship Program will be posted soon on both kci-edgemoor.com and cwcjv.com, the website for Clark | Weitz | Clarkson. The City of Kansas City, Missouri Aviation Department is issuing this Notice of Availability and Public Hearing to advise the public that a Draft EA and Section 106 Review was distributed to be available for public review beginning on August 23, 2018. The public comment period starts on August 23, 2018 and ends on October 2, 2018. A listing of the specific locations where a hardcopy may be reviewed and an electronic version of the draft document is available online at http://FLYKCI.com and at https://www.kci-edgemoor.com/documents/. The public workshop and hearing will be held from 6:00 p.m. to 8:00 p.m. on Monday, September 24, 2018 at the Ambassador Building located at 12200 N. Ambassador Dr., Kansas City, Missouri. Oral and written comments may be presented at the hearing. If you need assistance with language or accessibility, please contact J. Jade Liska, City of Kansas City, Missouri Aviation Department at (816) 243-3045. Cash-flow is the most-often cited obstacle for small businesses. Not having the resources to add employees, or being able to sustain their companies during what can be lengthy pay cycles, are the top reasons many small firms do not pursue work that could otherwise help grow their businesses. In order to make work on the new terminal accessible to more small businesses, the Edgemoor team has partnered with Lead Bank to provide a low-interest loan program for disadvantaged firms. Furthermore, Edgemoor and it's construction team, Clark | Weitz | Clarkson (CWC), have made a commitment to its subcontractors to pay verified invoices within two weeks of receipt, instead of the traditional 45-60 days. As one small business owner noted, this “pay without delay” policy is a “game changer” for small firms. KANSAS CITY, Mo. - The Edgemoor Team delivering a new terminal at Kansas City International Airport is expanding its ranks with notable local talent. Edgemoor team member Clark | Weitz | Clarkson (CWC), the joint venture responsible for the design and construction of the New Terminal, has selected JE Dunn Construction as the design-builder for the KCI New Terminal parking structure. JE Dunn joins a growing list of homegrown firms making significant contributions to the design and construction of the New Terminal project. 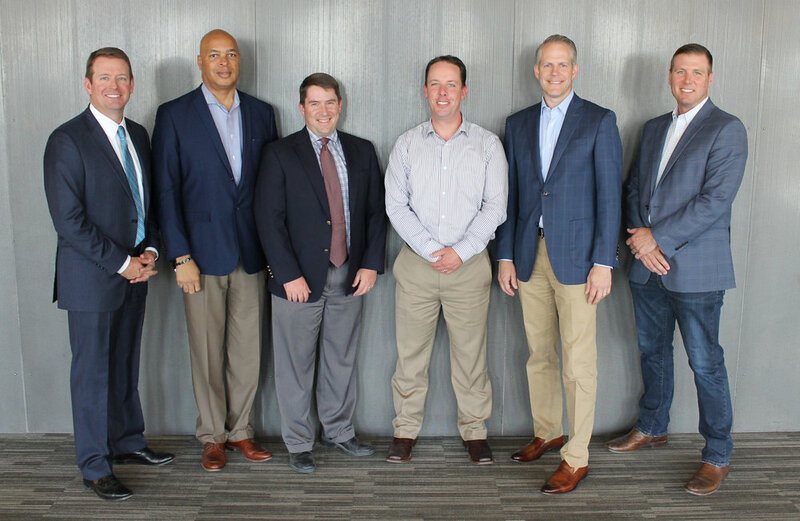 Just two weeks ago, CWC announced the addition of mechanical contractor U.S. Engineering Company and electrical services contractor Capital Electric Construction Company to the team. Combined, the mechanical, electrical, and parking garage scopes represent nearly 40 percent of construction activities on the new terminal – all awarded to Kansas City-based firms. CWC Vice President Mark Goodwin calls the addition of the local construction giant a “win for the project, and the City.” “JE Dunn’s national reputation for quality work and strong local relationships make them a great partner and addition to our growing team; we're proud to have them on board,” notes Goodwin. As design-builder for the seven-level parking facility, JE Dunn will lead the engineering and architectural design of the new structure and is responsible for coordinating design with the terminal building and all aspects of construction. The parking garage will sit adjacent to the new terminal and is estimated to include 6,500 parking spaces, a more than 50 percent increase compared to the current garage spaces at KCI. The firm is busy building out its team with local companies to carry forward Edgemoor’s commitment to maximizing opportunities for minority- and women-owned firms on the project. Headquartered in Kansas City, Mo., JE Dunn brings 90 years of construction experience and a deep bench of local talent to the KCI project. The firm’s reputation for delivering award-winning work, including projects like the Cerner Innovations Campus, Phases I and II, and Kansas City Missouri Police Department East Patrol Division and Regional Crime Lab, has earned them national industry recognition, including Engineering News-Record’s Midwest Contractor of the Year title in 2017. The company has amassed a national aviation portfolio, which includes a combined 1.47 million square feet of parking garage space at Terminals A and C at Kansas City International Airport. JE Dunn has nearly 1,100 employees in the greater Kansas City metropolitan area, many of whom will support efforts to deliver the new parking structure. JE Dunn joins a growing and diverse team of local Edgemoor partners, which collectively includes more than 40 Kansas City-based firms, 33 of which are certified minority- and women-owned businesses. A groundbreaking for the KCI New Terminal is anticipated this fall; and construction activities will begin in early 2019. Edgemoor Infrastructure & Real Estate is a leader in the development, financing, and operations of public buildings, infrastructure, and commercial real estate, and has delivered (or has under construction) more than $3 billion public-private partnerships (P3s) nationally, including the KU Central District Development project in Lawrence, KS; the Long Beach Courthouse and Long Beach Civic Center projects in Long Beach, CA; and the University of California, San Francisco Sandler Neuroscience Center. In 2017, Edgemoor was selected by the City of Kansas City, Missouri, to lead the development, design, and construction of a new single terminal at Kansas City International Airport. For more information on the KCI New Terminal project, or the Edgemoor Team, visit www.kci-edgemoor.com or follow kciedgemoor on Twitter. Clark | Weitz | Clarkson is a joint venture team comprised of Clark Construction Group, LLC, The Weitz Company, and local heavy civil contractor, Clarkson Construction. CWC is a member of the greater Edgemoor Team and responsible for leading design and construction efforts on the KCI New Terminal project. The team boasts a combined 400 years of construction experience and has successfully delivered complex airport projects across the country, including work at Los Angeles International Airport, Houston Hobby Airport, Dulles International Airport, BWI Thurgood Marshall Airport, Sea-Tac International Airport, George Bush Intercontinental Airport, Phoenix Sky Harbor International Airport, Reagan National Airport, Tampa International Airport, San Francisco International Airport, Midway Airport, among others.